OEclassic 2.7 completely substitute for Outlook Express and Windows Live Mail. It helps to use easily, fast and with amazing new graphics! 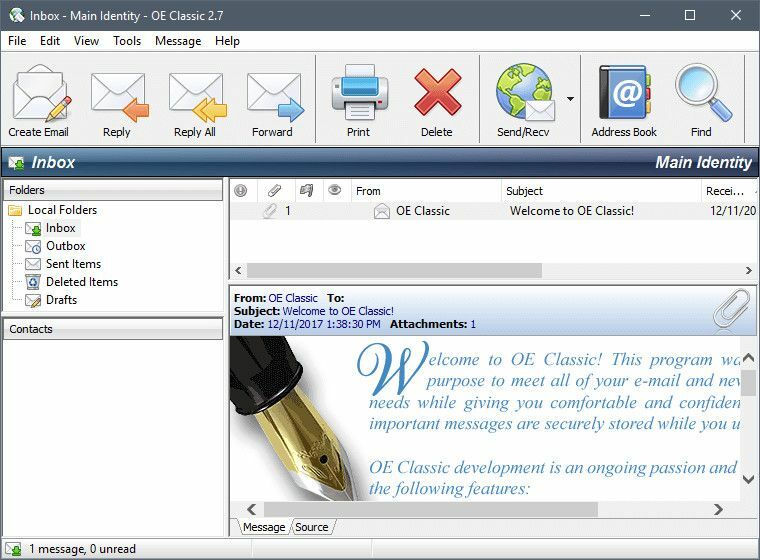 OE Classic is one of the most secure programs based on the independent research regarding the recently discovered “Mailsploit” set of vulnerabilities. There are as many as 30 other email clients affected by these vulnerabilities. OE is unaffected! By using OE Classic, you are safe against this one and also many other email threats because OE Classic employs various other security measures to protect you. As you may know, we carefully monitor everything that happens in the world of computer-security and whenever we learn something new, we implement that in OE Classic to pass on that protection to you as well. You can see more info on all the work done over the years in our news page. Over the years, we also warned our users how unsafe it is to use older operating systems and older email clients which don’t take security as seriously as we do and we’re so glad others are taking notice of that as well!